A Chinese scholar possessed ‘Four Treasures’: a brush, ink, paper and ink stone, essential for practicing calligraphy and painting. Many other objects would be found on a scholar’s desk, which were used for writing and painting but also for activities such as drinking tea. 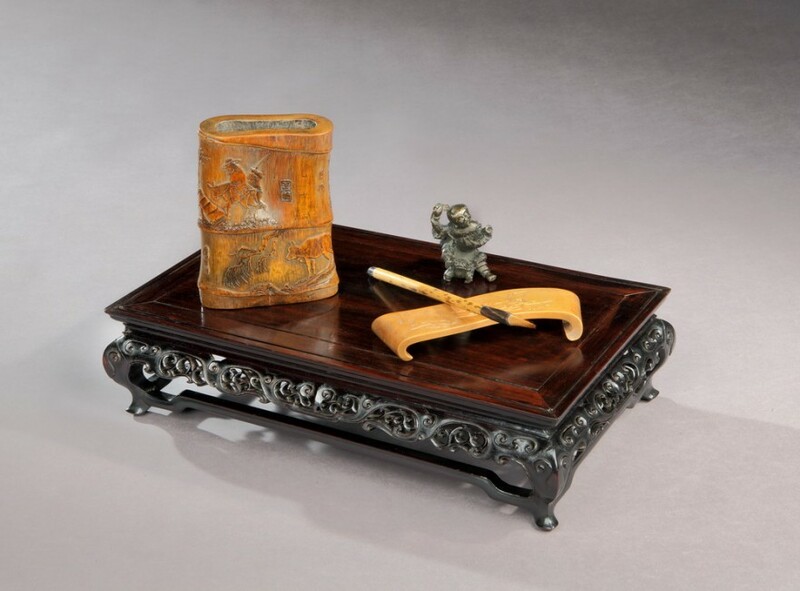 Besides, Chinese scholars were often collectors of functional and inspirational objects which if they were small enough could decorate their desks. In his ‘Vessels for the Studio’ Tu Long (1542-1605) listed as much as 45 different scholars’ objects, amongst which brush pots, seals, water droppers, wrist rests, scroll holders, paper weights and the less expected meditation lamps, evil-warding mirrors, rocks and swords. The objects were used for study, contemplation and stimulated social discourse. Brush pots made of valuable materials and with elegant embellishments were held in great reverence. Together with wrist rests they were often made of bamboo, making use of a natural curvature, but also of wood, porcelain, lacquer and jade. Natural materials and themes were most appreciated by scholars. 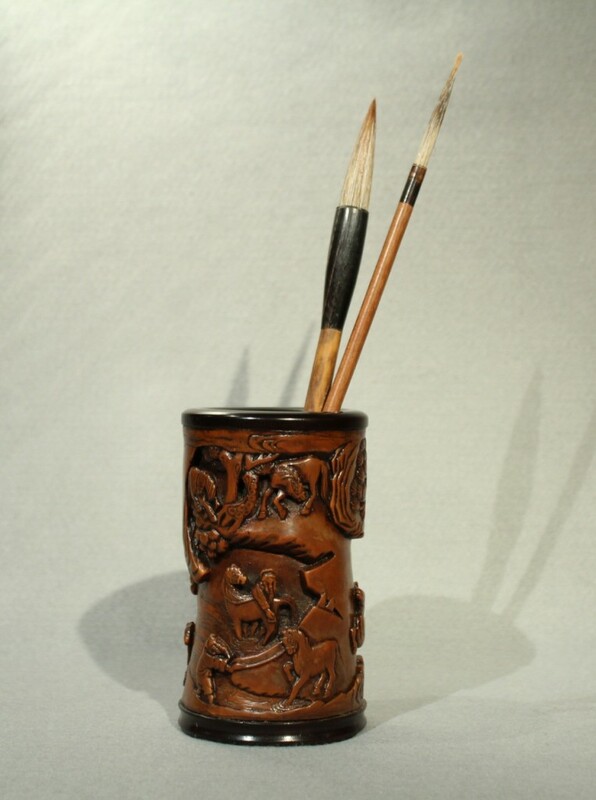 Brush pots were decorated with scenes of literati subject matters, inscribed with poetry and marked with the seals of their makers, not unlike paintings. They were sometimes kept bare so as to emphasise their natural and sometimes unusual forms. 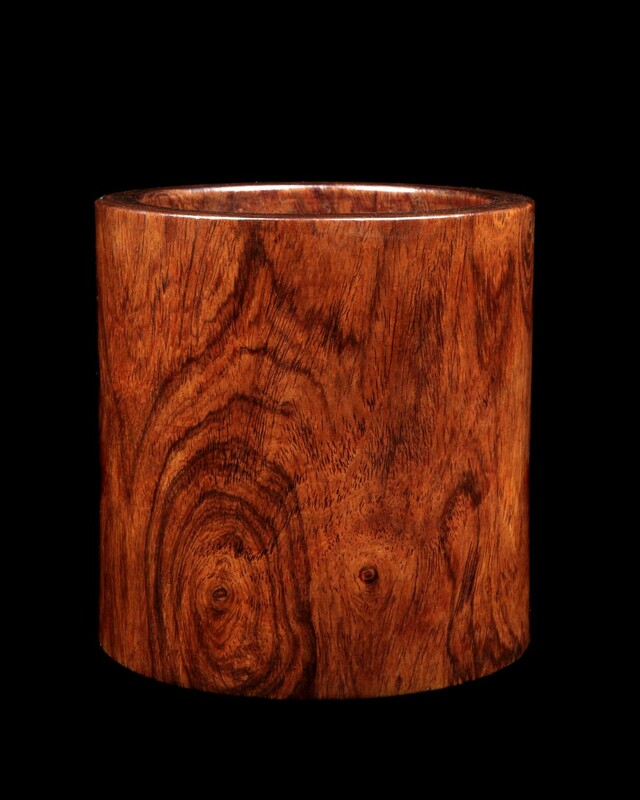 Precious hardwoods such as huang huali or zitan were admired for their exquisite grain but were sometimes carved to imitate humbler materials such as bamboo or gnarled root, because scholars were not meant to be interested in monetary value; on the contrary they aspired to escape mundane concerns.